USA shipping rates starting at ONLY $4.00; We Offer USA Promo Flat Rate Shipping Option. WE SHIP WORLD WIDE! 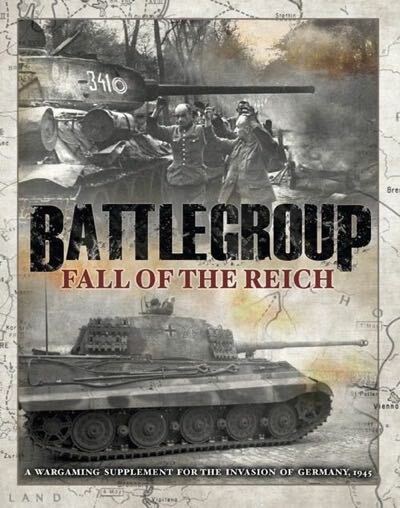 Supplement to the Battlegroup gaming system covering the invasion of Germany 1945 - primarily but not exclusively designed for 20mm and 15mm scales. Four new army lists (Russian, British and American armoured spearheads pitted against "Defenders of the Reich" ad hoc battlegroups from Germany's last desparate levy), modelling guides and a mini campaign for the breakthrough to Berlin. All in a lavish 194 page hardback book - heavily illustrated with inspiring miniature and historical photographs and artwork. Purveyors of the best in 28mm wargaming miniatures and accessories since 2000. Copyright BrigadeGames.com. All Rights Reserved. eCommerce Software by 3dcart.